Notre Dame and Duquesne will head into Tuesday’s Gotham Classic Showcase game coming off wins. 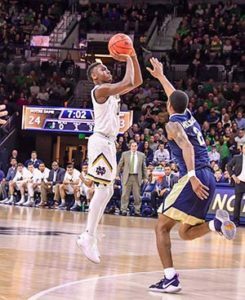 At Notre Dame, T.J. Gibbs (pictured) netted 18 points and pulled down six rebounds to lead the Fighting Irish to a 73-64 win over William & Mary. D.J. Harvey added 15 points, John Mooney posted 13 points and 11 rebounds and Prentiss Hubb tallied 11 points. The Tribe led by one at the break, 28-27, and both teams shot 50 percent or better in the second half. However, it was Notre Dame’s 40-30 advantage in rebounding that resulted 16 second chance points that put the Irish over the top. Nathan Knight paced William & Mary with 18 points, seven rebounds, and six assists. Matt Milon and L.J. Owens each scored 11 points. In Akron, Ohio, playing at LeBron James Arena, Keith Dambrot returned to his old stomping grounds at St. Vincent-St. Mary High School and led his Duquesne squad to a 69-64 win over Radford to raise their record to 3-0 in the Gotham Classic – the only unbeaten team in the tournament. Mike Lewis II posted a game-high 15 points for the Dukes, who also received another double-double from Eric Willliams, this one of 14 points and 10 rebounds. Ichael and Frankie Hughes each scored 10 points. The Highlanders were led in scoring by Mawdo Sallah and Carlik Jones, each of whom had 14 points. Ed Polite Jr. recored 11 points and 15 rebounds. Gotham Classic concludes Tuesday when Notre Dame hosts Duquesne in the Gotham Classic Showcase Game and Radford travels to William & Mary.